Iowa (-17) at Indiana (Saturday, November 6, 12 pm ET) - There are so many reasons I like Iowa here that I hardly know where to start. Indiana’s offense, though effective earlier in the season, has struggled recently, and they aren’t likely to get rolling against a very good and very confident Iowa defense. Indiana’s defense is brutal - they let Arkansas State score 34 points, and Illinois piled up 43. Iowa’s offense is firing on all cylinders. The Hawkeyes have a good shot at winning the Big Ten, but they need to win big, they need to beat Ohio State, and they need some help from Wisconsin. They don’t control their fate entirely, but they can do what they can in their remaining games - and that starts with kicking the crap out of Indiana. 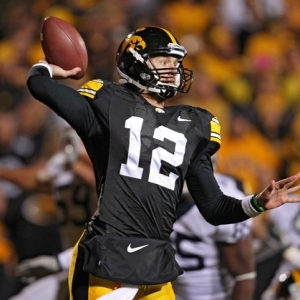 I also like that Iowa is on the road - they are a very impressive 16-5 ATS in their last 21 road contests. That’s a sign of a team that has their act together. I wouldn’t have a lot of faith in Indiana if they were at full strength, but they are dealing with injury issues - including a very concerning ankle issue for QB Ben Chappell - so they can’t even punch at their full weight. Iowa’s defense is going to shut down Indiana’s offense - just look what they did to a more competent Michigan State unit last week. Iowa’s offense is going to roll against Indiana’s underwhelming offense. Iowa is highly motivated, while Indiana is just plain frustrated and beaten down after losing four of their last five. That all adds up to a solid cover for the Hawkeyes. Arizona State (+5.5) at USC (Saturday, November 6, 10:30 pm ET) - Neither of these teams is doing great right now - the Trojans have one win in their last four, while Arizona State has lost four of six. When you look a little closer at it, though, you see tha these are two teams in very different places. Arizona State’s two wins hardly count - they have come against a lousy Washington State team and a Washington team that clearly isn’t any good, either. Their losses, meanwhile, haven’t been great - especially a 33-point loss at Cal two weeks ago. They just are not a very good team right now. On top of that they are dealing with the drama of a coach that is almost certainly on a burning hot seat. USC, meanwhile, crushed Cal for their one win, and their losses have been much better - two points in a classic game against Stanford that ended in the final seconds, and a single point to Washington. In other words, USC has been close to a much better record. I don’t want to suggest that USC is good, but they are much better right now. USC’s offense is playing very well right now, and should be able to have another solid day against the Sun Devils. Arizona State’s offense can be good when it is form, but that form has been fleeting recently. I think it is fair to say that we can expect a much more consistent effort from USC than from Arizona State in this one. Since they are at home I have no problem imagining them winning this one by a touchdown or more. That makes the Trojans a nice pick. Looking for a premier college football handicapper for winning college football picks? Look no further than Jason Sharpe. Sharpe has already picked up nearly $7,000 for his football clients and he has another big card this weekend (including a 6-Unit College Football Underdog Game of the Year as he has shown a profit in nine of 10 football weeks thus far as well as a 7-2 record for picks 6-units or higher. Find out why this professional Vegas bettor is terrifying the bookies in Sin City and across the globe. Call Doc’s Sports toll-free at 1-866-238-6696 to get a free week of Sharpe’s picks or any of the other fine college football handicappers at Doc’s Sports (new customers only).